Since the late 1960s, there has been an acceleration of research focused on understanding how the efferent ducts, the epididymis, and the vas deferens function with respect to the maturation and storage of spermatozoa and as hormone dependent tissues. Another major interest in the epididymis is that it is an attractive target for the development of male contraceptives. There are well over 16,000 peer reviewed articles in the literature on these tissues, their structure, gene expression, protein synthesis and function. Regular international meetings have been initiated that are dedicated to this field. Thus, there is an urgent need for a comprehensive reference volume that spans every facet of epididymal biology, from historical background to the most current results, from basic cell and molecular biology to clinical issues. Well-established experts from every part of the world have contributed to this volume. By necessity, each author was given page limitations so that many topics are not dealt with exhaustively. Whenever possible, references to more comprehensive discussion of specific topics are included. The epididymis has become increasingly important to researchers engaged in fertility and its regulation. Until now, no single volume review of the field has been available. 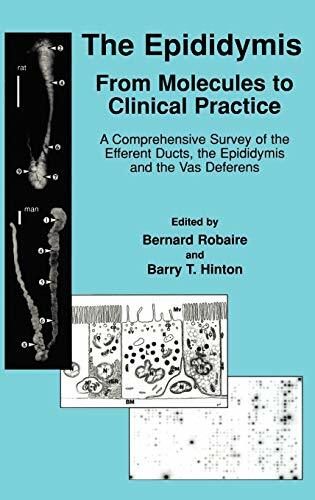 "The Epididymis: From Molecules to Clinical Practice A Comprehensive Survey of Efferent Ducts, The Epididymis and the Vas Deferens" will provide a complete, up-to-date, in-depth review of the research on the male reproductive tract. Structure, function, and molecular mechanisms underlying the control of the efferent ducts, epididymis, and vas deferens will be reviewed.